It’s on. Spring means the beginning of our primetime fly fishing season in Bozeman, Montana. Guided fly fishing trips are going out daily and all of our local rivers are fishing well pre-runoff. We even offer a special spring guide trip rate before May 1st that lets anglers hit the rivers with our professional fly fishing guides before the crowds arrive. Our anglers can expect to fish the Missouri River, the Madison River, theYellowstone River, the Jefferson River, and the Paradise Valley Spring Creeks during the months of March and April. We generally employ a variety of tactics including dry fly fishing, nymphing, and streamer fishing. Hatches consist of midges, blue winged olive mayflies, and march brown mayflies. Anglers can expect to fish the Missouri River, the Paradise Valley Spring Creeks, and the Madison River during the month of May. We employ similar tactics to match the hatches of blue winged olive mayflies and mother’s day caddisflies during the month of May. Don’t miss out on our Missouri River guided fly fishing trips in May. This is can’t miss fishing. Summertime in Bozeman, Montana means fly fishing is great and the living is easy. The summer months of June, July, and August are peak season on all of our local rivers and for good reason. By July run-off is over and all of our rivers offer great fishing on a daily basis. Thick hatches of stoneflies, mayflies, and caddisflies get even the biggest of trout looking up for dry flies. Summer also means the widest variety of fishing destinations for our anglers. 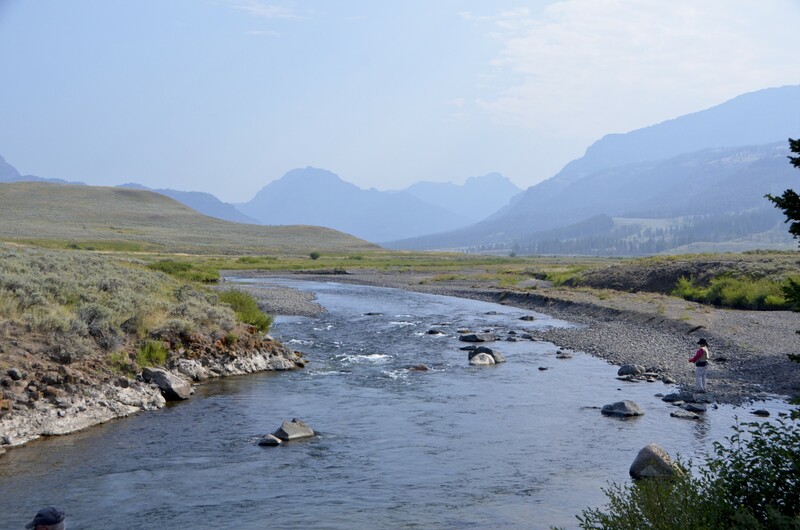 Anglers can expect to fly fish the Missouri River, the Paradise Valley Spring Creeks, the Madison River, and Yellowstone National Park during the month of June. Hatches consist primarily of caddisflies, stoneflies, and pale morning dun mayflies. The month of July offers anglers the widest variety of waters including the Yellowstone River, the Madison River, the Missouri River, the Paradise Valley Spring Creeks, the Boulder River, the Stillwater River, the Jefferson River, Yellowstone National Park, and many private waters near Bozeman. Hatches are prolific and varied in July including caddisflies, stoneflies, mayflies, and terrestrials. August means more of the same for our anglers on normal and high water years. During low water years some of our rivers become too low to float but still offer fantastic wade fishing. The hatches of July dwindle by August but anglers can expect consistent hopper fishing all month long. And who doesn’t love catching wild trout on big hoppers? September is the start of our fall fly fishing season in Bozeman, Montana. Many of our longtime anglers find fall to be their favorite time to fly fish in Montana. The crowds of summer are gone, the fly fishing is great, and the options are endless. Hopper fishing remains great through the end of September and by October our hatches come full circle and blue winged-olives and larger mayflies including callibaetis and grey drakes fill out the trout menu. Our brown trout get aggressive pre-spawn and the streamer bite becomes one of the main attractions. The hills are orange as the leaves begin to turn and snow caps the high mountains. Hard to think of a better backdrop for a Montana fly fishing trip. Our anglers can expect to fish the Yellowstone River, the Madison River, the Missouri River, the Paradise Valley Spring Creeks, the Jefferson River, the Stillwater River, and Yellowstone National Park during the fall months. Hoppers are king through September but begin to fade with the first freezes of fall. Mayflies and caddis hatch through October and midge hatches are thick through November. When most people think of winter in Montana snow, skiing, and cold are what they think of before fly fishing. But our Bozeman, Montana fly fishing guides know that the fishing doesn’t stop when the snow hits the ground. Winter fly fishing isn’t for everyone, but if solitude is what you value there is no better time to fish our great rivers and streams than during the winter months. While we cannot book trips more than a few days in advance due to inclement weather, if you find yourself in Bozeman, MT from December to February and need a quick fishing fix, give us a call. Anglers can expect to fish the Paradise Valley Spring Creeks, the Madison River, the Gallatin River, and the Missouri River during the winter months. Midges are the primary hatch. Just don’t forget your hand warmers!